← Over 200 – 2016 World Series Champion Chicago Cubs Autographs Now In Stock! 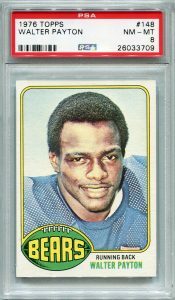 This entry was posted in Graded Football Cards, New Releases and tagged 1976 topps walter payton, chicago bears rookies, payton bears psa, walter payton psa, walter payton rookie. Bookmark the permalink.